Mazda has announced a new version of its MX-5. The Sport Graphite will be limited to just 500 cars and offer improved equipment levels and exclusive styling. Order books are now open and prices start at £20,995. The special edition will be available with two petrol engines – a 1.8-litre with 126PS and a 2.0-litre with 160PS – both mated to a five-speed manual gearbox. There are no mechanical changes to speak of, so performance remains the same, with the 1.8-litre unit capable of covering 0-62mph in 9.9 seconds, while the larger 2.0-litre engine reach 62mph in just 7.9 seconds. Top speed will be 123mph and 136mph respectively. All models feature Mazda’s Dynamic Stability Control (DSC) and traction control as standard, with the 2.0-litre model getting a limited slip differential and Bilstein suspension. Other improvements include 17-inch dark gunmetal alloy wheels and black leather heated seats as standard, along with 5.8-inch TomTom navigation system with integrated Bluetooth. Prices start at £20,995 for the 1.8 and rise to £22,995 for the 2.0-litre model. Mazda is also offering zero per cent interest with no deposit. 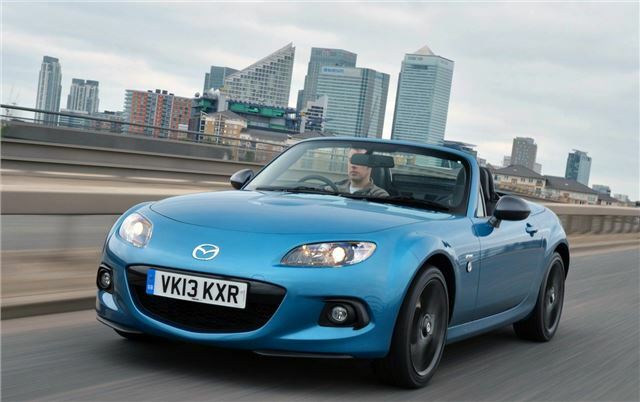 Current MX-5 owners will also qualify for a loyalty bonus of £500, with no obligation to part-exchange their existing vehicle.